Ages 8 through 14. This card set includes 20 creatively-illustrated picture pairs. The two pictures in each pair are almost identical. 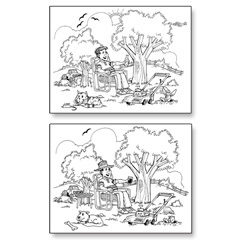 Challenge your students to describe how the pictures are the same and how they are different. To describe the differences, students must use precise descriptive vocabulary. Your students will enjoy talking about the similarities and differences in these humorous 8.5"x 11"cards.